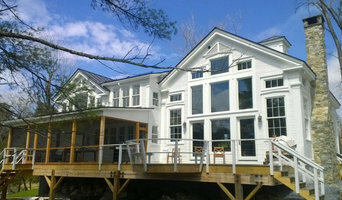 Cambium Construction is a residential design build team based in Middlebury, Vermont. We can build from your architect produced plans or design from your own ideas and produce a product that meets your needs and design aesthetic. Chris Stackhouse -President of Cambium Construction has been in the building business for 40 years. In the early years of Chris’s building career he worked for several respected construction firms, but found that being self employed was much more fulfilling. Designing and Building comes naturally for Chris and seems to be in his blood, as he comes from a long line of family architects, artists and builders. He is a master carpenter, artist, drafts person, energy conservationist as well as historic preservationist. Chris recognizes that a home is probably the largest and most important investment a person can make. He wants to insure that every project which he has involvement in is not only built to the clients design aesthetic, but also is practical and suits their personal lifestyle. Chris also believes that any project whether it is new construction or a renovation can be and should be energy efficient and built from high quality, low-maintenance materials. Our motto “Building quality for life” kind of says it all. To date we have built or renovated 8 high performance homes. One of our highest performance homes has achieved an ACH 1.2 and HERS score of 40. 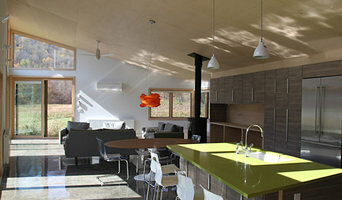 We hope to find a customer who wishes to work together on a passive or net zero home. 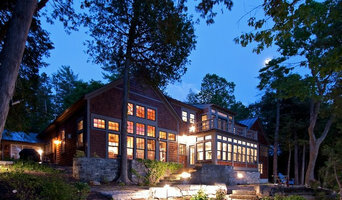 Patterson and Smith Construction, Inc.
Patterson & Smith Construction is a full-service residential construction company located in Stowe, Vermont. For more than 25 years we have specialized in building, renovating and maintaining homes and businesses for our friends and neighbors. No matter the size and scope of the work, we provide our customers with quality craftsmanship and exceptional customer service so that the end result is a beautiful and functioning home or business. We are proud of the projects we have completed and the relationships that we have built along the way. Our approach celebrates collaboration and creation. The term Studio in the firm name refers to an architectural design process of collaborating with individuals and goes well beyond the walls of the studio. Our belief that the client has much to bring to the design table as well as the various craftspeople and general contractors who execute the designs is fundamental to the success of the project. Architecture is a complex process that involves many skilled and well-informed people, but also relies on intuition and a vision. As design leaders, we bring together a strong team of professionals to not only complete your project but ultimately exceed your expectations by bring your vision to life. 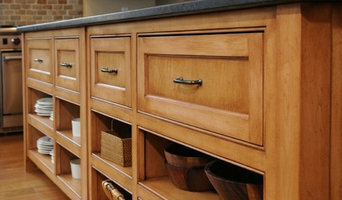 Each home design project, like each client, is unique. Your needs, style & taste are of the utmost importance. Your budget and building site are all interdependent and equally crucial to project success. Each aspect of your project is a work of art waiting to be discovered and will ultimately BELONG to you. We find our inspiration for architectural designs by understanding your needs and desires and making them a reality for you to enjoy for many years to come. Cultivation Design Build is an interdisciplinary design studio where art, architecture, and construction are integrated in the pursuit of innovative design solutions. Our goal is to create enduring design; encouraging environmentally and socially responsible development while simultaneously encouraging a market for products and/or services that benefit humans and our environments. Adam Ginsburg has built his practice of architecture on a combination of rigorous training, broad experience in the practical arts and crafts of construction, and careful attention to both the concrete goals and the creative dreams of his clients. His childhood love of drawing grew into a degree in history and architecture at Washington University in St. Louis. He went on to a Master’s degree in Architecture at the Rhode Island School of Design in Providence, and studied at the Ecole des Beaux Arts in Lacoste, France, where he was selected for the deKooning Award and scholarship. In more than a decade of practice, he has sought out opportunities to work in diverse areas of construction, integrating hammer-and-nail experience with his creative design practice in both residential and commercial building. 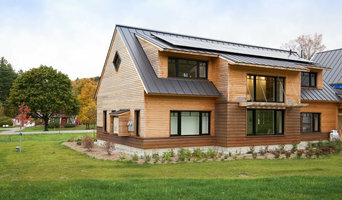 His affection for the landscape and communities of Vermont and New England, and his concern for the future of our environment have merged in a commitment to sustainable design and construction practices. Adam believes that true success in any design process depends on the quality of the collaboration between an architect and a client. He is committed to listening, and to applying his rich, diverse training and experience to translating the client’s wishes and dreams into attractive, comfortable places for living. Adam is a member of The American Institute of Architects, and is licensed in the state of Vermont and certified to practice architecture throughout the United States and Canada.